An area of low pressure we have been watching over the past couple of days has formed into Tropical Storm Ida this Saturday morning. She has sustained winds of 40mph and is moving to the northwest at 10mph. Like all other storms this season, she is going to be affected by wind shear and dry air keeping her at tropical storm strength over the next 5 days. She is very far away from the Grand Strand and is likely not going to have any effects on the area. Over the next few days she is forecast to move to the northwest and then curve out further into the Atlantic not posing any threat to the US coastline or any other landmass. We’ll continue to monitor Tropical Storm Ida as she continues to churn in the open waters of the Atlantic but for right now there is no need to worry. The Marianas Islands in the Northwestern Pacific Ocean were in the tail of Tropical Storm Krovanh’s “comma shape” when NASA’s Aqua satellite passed overhead early on September 16. On Sept. 16 at 03:50 UTC (Sept. 15 at 11:50 p.m. EDT) the Moderate Resolution Imaging Spectroradiometer (MODIS) instrument aboard NASA’s Aqua satellite captured a visible image of Tropical Storm Krovanh. The center of Krovanh was east of the northern Marianas Islands, while a thick band of thunderstorms that resembled the tail of a comma, stretched over the island chain. National Weather Service (NWS) in Tiyan, Guam noted that a tropical storm watch remains in effect for Alamagan, Pagan and Agrihan in the northern Marianas Islands. Tropical storm conditions including tropical storm force winds of 39 mph or more are possible within 24 hours. For updated forecasts from the NWS in Guam, visit: http://www.prh.noaa.gov/guam/cyclone.php. At 0900 UTC (5 a.m. EDT) on Sept. 16 the Joint Typhoon Warning Center noted that Krovanh had maximum sustained winds near 55 knots (63.3 mph/101.9 kph). It was 20.1 North latitude and 146.8 East longitude, about 391 nautical miles (480 miles) north-northeast of Andersen Air Force Base, Guam and within 115 miles of Agrihan. Krovanh has tracked west-northwestward at 13 knots (15 mph/24 kph). The JTWC expects Krovanh to peak in intensity on Sept. 18 as it passes east of the island of Iwo To, Japan, when maximum sustained winds are forecast to reach 115 knots. Thereafter, Krovanh is expected to turn to the northeast over the open waters of the Northwestern Pacific and become extra-tropical. NASA’s Terra satellite analyzed Tropical Storm Loke in infrared light as it continued strengthening in the Central Pacific. Loke formed on August 20 at 11 p.m. EDT as Tropical Depression 4C. By August 21 at 5 p.m. EDT the depression strengthened into a tropical storm and was renamed Tropical Storm Loke. NASA’s Terra satellite gathered infrared data on Loke using the Moderate Resolution Imaging Spectroradiometer or MODIS instrument. 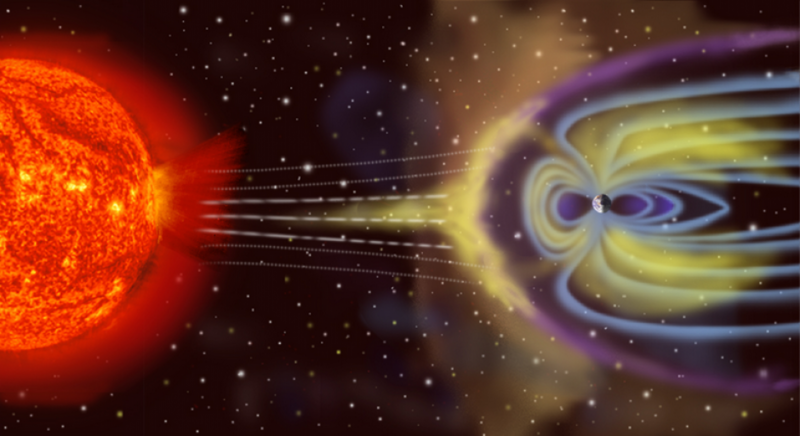 Terra passed over Loke on August 24 at 09:50 UTC (5:50 a.m. EDT). The data showed that the strongest storms, with the coldest cloud top temperatures were north of the center of circulation. Highest, strongest thunderstorms stretch high into the troposphere (lowest layer of the atmosphere) and the higher the cloud top, the colder it is. Cloud top temperatures were near -63F/-53C indicating these thunderstorms were capable of generating heavy rainfall. Loke is expected to reach hurricane strength later today, and a hurricane warning is in effect for portions of the Papahanaumokuakea Marine National Monument, from Pearl and Hermes Atoll to Lisianski Island. In addition, NOAA’s Central Pacific Hurricane Center posted a tropical storm warning is in effect for Midway Island, portions of the Papahanaumokuakea Marine National Monument from Lisianski Island to Maro Reef. At 8 a.m. EDT (2 a.m. HST/1200 UTC) the center of Tropical Storm Loke was located near latitude 24.4 north…longitude 178.0 west. Loke is moving toward the northeast near 15 mph…24 km/h. Loke is expected to turn to the north on August 25. CPHC noted “On the forecast track the outer winds of Loke should reach the warned areas within the Papahanaumokuakea Marine National Monument during the afternoon on August 24 with the core of Loke passing through the warned area at night. Maximum sustained winds are near 65 mph (105 kph) and is expected to become a hurricane on August 25. The estimated minimum central pressure is 995 millibars. Tropical Storm Guillermo continues to strengthen in the Eastern Pacific and maintain its course toward Hawaii. The cyclone is expected to build into a Category 1 hurricane today and maintain hurricane strength for several days before weakening back to a tropical storm on Tuesday. But forecasters acknowledge the system has a lot of unknowns at this point. It could pass north of the state, bringing humidity reminiscent of tropical storms Ela and Enrique. It could hold its northwest track toward the island, or even weaken and veer south, said John Bravender, a forecaster with the National Weather Service in Honolulu. The storm could also intensify beyond current projections. By Tuesday night, the system is expected to be about 500 miles east of the Big Island as a tropical storm circulating 65 mph winds. At that point, a forecast break in a high pressure ridge should have the system veering onto a more northwesterly tack away from the islands, National Weather Service forecasters in Florida say. 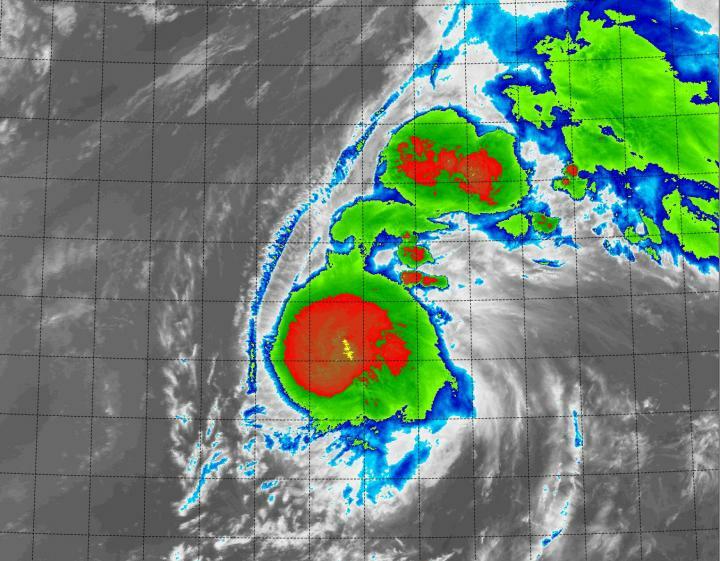 Located 1,955 miles east-southeast of Kailua-Kona, Guillermo is set to peak with 90 mph winds on Saturday and Sunday, with some weakening beginning Monday as the system moves into an area of increased wind shear and lower sea surface temperatures. The storm is traveling west-northwest at 13 mph, with tropical storm force winds extending 60 miles from the center. Guillermo is traveling south of a subtropical ridge, and weather models show a break in the ridge developing in the next few days, allowing the storm to begin a slight northwestward turn about 800 miles east-southeast of Hilo on Sunday. The forecast track has the storm gradually slowing in forward speed in the beginning of the week. Dennis Feltgen, spokesman for the National Hurricane Center in Florida, cautioned that extended forecasts have a high degree of uncertainty. Packing 45 mph winds, Guillermo is in a moist, unstable environment with 84 degree water conducive for development over the next several days. Forecasters with the NHC say the storm could go through a period of rapid intensification today. Satellite imagery shows bands of thunderstorms churning in the storm’s northern quadrant and entering the center from the west. Guillermo is expected to enter the Central North Pacific basin on Saturday. Tropical Depression Eight E became a remnant low overnight about 1,000 miles east of Hilo. The low was generating scattered thunderstorms at it moved west as 10 to 15 mph. The system is not expected to redevelop or have much effect on Hawaii. Hurricane Delores was packing 85 mph winds as it churned in waters off the southwestern coast of Mexico Tuesday afternoon. Forecasters expect Delores to near Socorro Island on Wednesday. Delores, located 250 miles southwest of Cabo Corrientes, Mexico, is forecast to continue strengthening and should be upgraded to a major hurricane on Wednesday, forecasters with the Miami-based National Hurricane Center said. A major hurricane features sustained 1-minute surface winds of at least 111 mph, or the equivalent of Category 3 storm on the Saffir-Simpson scale. Tuesday afternoon, the storm was packing 85 mph winds and moving west-northwest at 7 mph. It featured a 20-mile-wide eye and hurricane-force winds extending outward up to 25 miles from the center of the storm. Tropical storm force winds extended outward up to 150 miles. Forecasters expect Delores to continue strengthening during the next couple of days thanks to warm waters and light vertical wind shear in the Eastern Pacific ocean. It could peak Thursday as a Category 3 storm packing 120 mph winds before starting to weaken later this week as it encounters cooler waters. Swells generated by the storm, which are already impacting portions of the southwestern Mexico coast, were expected to reach the southern coast of the Baja California peninsula on Tuesday. Forecasters say Delores is likely to pass near Socorro Island, which is located several hundred miles off the Mexican coast, on Wednesday. Also being monitored Tuesday afternoon was Tropical Storm Enrique, located 1,365 miles west of the southern tip of the Baja California peninsula. The storm, which strengthened overnight Monday into Tuesday, was packing 50 mph winds and moving toward the west-northwest at 9 mph. The tropical storm is forecast to weaken starting Wednesday as it encounters cooler waters and increased wind shear. It should be downgraded to a remnant low by the end of the week. Elsewhere in the Eastern Pacific, no tropical cyclone formation is expected through the end of the week. Meanwhile in the Central North Pacific basin, which is where Hawaii is located, Central Pacific Hurricane Center forecasters continued to monitor the remnants of Tropical Storm Iune located 930 miles southwest of Honolulu. Forecasters said that while isolated thunderstorms are still developing around the low, environmental conditions will likely prevent strengthening appreciably during the next couple of days. Elsewhere in the Central North Pacific, no tropical cyclones are expected through Thursday afternoon. The Central North Pacific and Eastern Pacific hurricane seasons continue through Nov. 30. 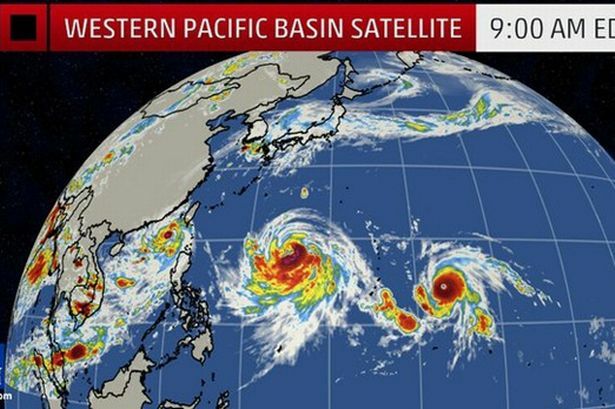 Any time you think the British weather is bad, be thankful you don’t live in Asia. South of Taiwan on the left of the graphic is tropical storm Linfa, with Typhoon Chan-hom east of China in the middle. And to the right of that is Typhoon Nankga, east of Guam. Typhoon Chan-hom has produced up to 12 inches of rain in Guam over the weekend, and is moving west towards the Japanese Ryukyu Islands, Taiwan and then eastern China this week, Accu Weather reports. 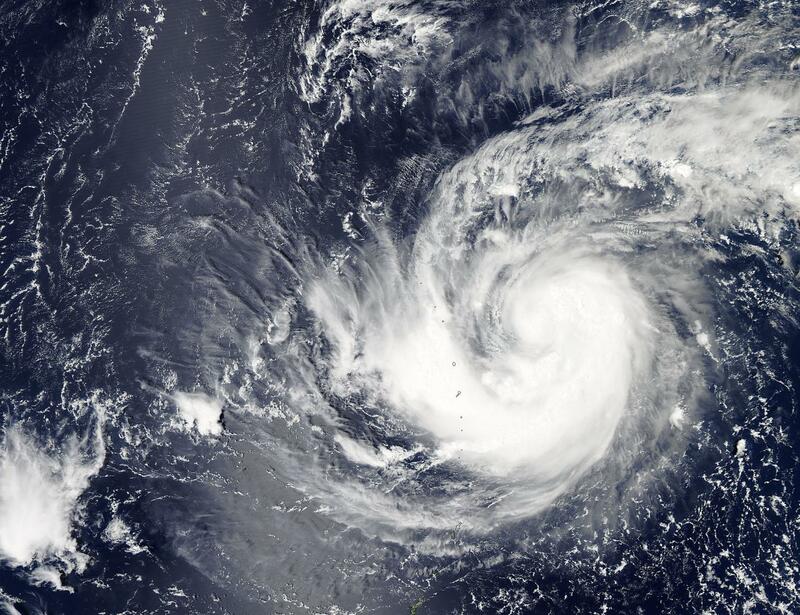 With winds of up to 80mph, Nankga was originally a tropical storm that was upgraded to a typhoon. It is expected to pass over the Northern Marianas islands, near Guam and east of the Philippines later this week. And Linfa has already been causing problems in the Philippines, with all shipping ordered to remain in harbour and some flights were cancelled in the north. Schools were closed in the capital, Manila on Monday due to flooding and landslides from the tropical storm, disaster officials said. Storm warnings were issued in at least 14 areas of the main Philippine island of Luzon as Linfa moved slowly across the north of the Southeast Asian archipelago. It was carrying maximum wind gusts of 60 mph. Alexander Pama, executive director of the National Disaster Risk Reduction and Management Council, said the storm would bring heavy rain within a 250 miles radius. “We are grounding all sea travel and fishing operations in the north because we expect sea waves to go as high as 13 feet, Pama said. “We don’t want any lose of life or any accidents,” he said. Army units had been placed on standby to evacuate people to temporary shelters if needed, Pama said. The government was expecting some crop damage in rice-producing areas in northern Luzon. Linfa made landfall in the north of the island on Saturday and was about 85 miles southwest of Laoag City in Luzon’s far north on Monday. An average of 20 typhoons pass through the Philippines every year. Haiyan, the strongest typhoon ever to make landfall in the Philippines, killed more than 6,300 people and left 1,000 missing in 2013. The weather services’s tracking forecast was modified several times today, with the predicted course moving from a direct hit on Rota this morning to a path that takes it south of Guam. The forecast could still change. According to the weather service’s 8 p.m. online advisory, the tropical storm was positioned about 750 miles east-southeast of Guam. Maximum sustained winds was 45 mph. The storm was moving west at 12 mph, with winds extending outward up to 60 miles from the center. The system is expected to turn to the west tonight and Thursday with a slight decrease in forward speed. 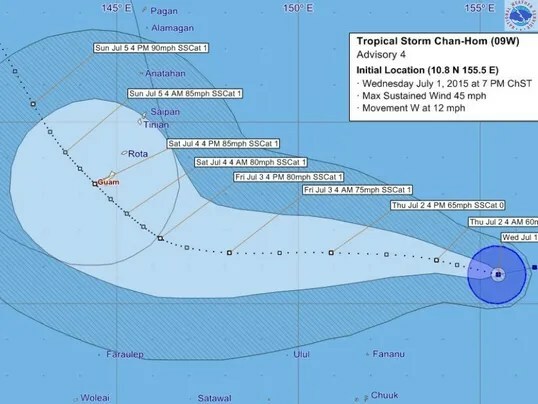 The storm is expected to bring rain showers and thunderstorms to Guam starting Friday, and winds are expected to strengthen over the weekend, said weather service meteorologist Brandon Aydlett. Inclement weather could extend into Monday, he said. The island can expect up to 12 inches of rain over the weekend, Aydlett said Wednesday morning. Several weekend events are postponed. The Liberation Carnival will be closed Saturday, and the Fourth of July fireworks are tentatively postponed to Sunday. The carnival will remain open tomorrow and vendors will begin breaking down their booths Friday, said Sinajana Mayor Robert Hofmann, event planner for the carnival. The Guam BBQ Block Party scheduled for Saturday has been postponed. The Guam Visitors Bureau will announce a new date when determined. The UAE’s National Centre of Meteorology and Seismology (NCMS) has said that latest satellite imagery and observations in addition to the weather reports from the main regional centres indicate that the tropical storm ‘Ashobaa’ has in the past six hours moved towards the northwest from its original position of west-central of the Arabian Sea. Currently, the centre of tropical storm lies at latitude of 20.3N and longitude 64.6 E, about 570km from Sur (Oman) and 730km from Muscat (Oman), with surface wind speed between 60–80km/hour. NCMS said it will intensify further into a severe tropical storm and move initially west-northwestwards in the next 24 hours. The impact on the UAE is expected to be indirect. The seas along the east coast of the country will rise by Wednesday night and Thursday morning. An increase in the amount of clouds to the East is expected, especially on the eastern mountains, according to the NCMS. NCMS says it will keep monitoring this weather case, as it is well known that such cases are highly uncertain and sometimes change quickly. It may be winter in the northern hemisphere, but Category 5 Tropical Cyclone Eunice is churning south of the equator as January wraps up. according to the U.S. Joint Typhoon Warning Center. This is an impressive rate of rapid intensification. At least six people perished in a tropical storm that battered Madagascar over the past two days, affecting almost 80,000 residents, according to an official toll published today. Local radio said as many as 13 people may have died, including two in Antananarivo, capital of the Indian Ocean island. Tropical storm Chedza swept through Madagascar on Friday and yesterday, adding to the country’s woes after the government resigned last week in the face of violent protests over recurring power blackouts. A meteorological report warned that there was still a danger of flooding in certain areas around Antananarivo. Two people died earlier this month when angry residents took to the streets to protest rolling power blackouts. A new prime minister was appointed last week after the resignation of the government which had come under fire for its handling of the repeated electricity failures.